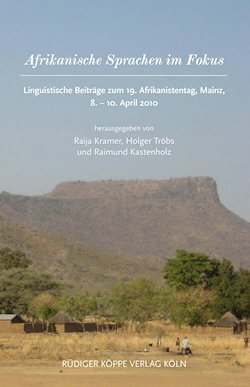 Following the tradition of past Afrikanistentage, this volume contains selected papers which are based on presentations held on the 19th Afrikanistentag. The conference took place parallel to and with contentual similarities to the Tagung der Vereinigung von Afrikanisten in Deutschland (VAD) on April 8–10, 2010 at the Johannes Gutenberg University Mainz, Germany. This year, both conferences focusing particularly on Africa happened to coincide with the 50th anniversary of political independence of many African states, which caused extraordinary attention by media. In consequence, this anniversary was also under the explicit focus of the VAD conference. Both congresses offered the opportunity to approach africanistic topics from highly diverging points of view and with different focuses, in this way gaining a broad insight into recent research projects. The vital discussion, the profitable exchange of ideas and the mutual insight into current scholarships from linguistics, literary studies and social sciences through selective collaboration showed that a fruitful interdisciplinary discourse is possible without marginalising the focal points and visibility of an autonomous Afrikanistentag. The present volume contains contributions regarding current research projects in the discipline of African Studies, which means dealing with the various natures of African languages as well as with their historical, societal and cultural aspects. On the one hand descriptive-analytic surveys of individual languages like Ikaan (Borchardt), Pɛrɛ (Kastenholz), Kolbila (Littig), Mombo (Prokhorov), Tima (Schneider-Blum), Lumun (Smits) and Duun (Tröbs) are provided which are dedicated to synchronic phenomena on many different linguistic levels. On the other hand surveys are found which focus on typological-comparative and diachronic aspects, like in the papers regarding Uncunwee (Comfort & Jakobi), Kanuri (Cyffer), Gbe (Fiedler), Mande (Schreiber) and Bantu (Fessler & Sommer) as well as various Adamawa languages (Kleinewillinghöfer, Kramer, Markgraf). Sociolinguistic issues are dealt with in the contributions on dialogue-organisational mechanisms in Swahili (Eck) and on distribution and denomination of millet in the Western Lake Chad region (Rothmaler). A literary contribution addresses the analysis of paratexts in Kano Market Literature (Feuerstein).